In an earlier blog, I described how the A-model starts with Problem, Performance and Program. But what is the A-model? Here’s an overview. It’s easy to explain why it’s called the A-model. 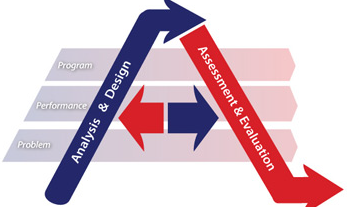 The model (shown on the left) traces the progress from Analysis & Design to Assessment & Evaluation. 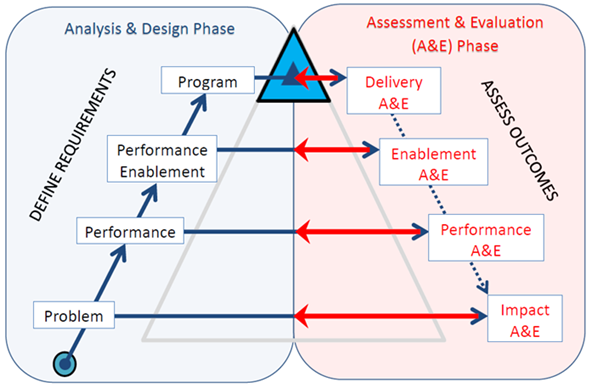 When following the A-model, you move from the lower left corner of the “A” up to the delivery of the Program (at the top or apex of the “A”) and then down the right side of the model to evaluate how the Problem has been resolved. The key logic in the model is that you work out the requirements for success in Analysis & Design, and then you assess against them in the Assessment & Evaluation phase. How can you know or measure if the problem is solved? What performance are you looking for and how do you measure if it is achieved? What are the requirements for the Program and how do you measure if they are met? It’s crucial to be able to do this in order to do Assessment & Evaluation against what you’ve worked out in Analysis & Design. Assessments are useful in Analysis & Design – for example needs assessments, performance analysis surveys, job task analysis surveys and employee/customer opinion surveys. A common way to evaluate the program is to administer surveys covering perceptions of satisfaction, relevance and intent to apply the Program in the workplace. This is like a “course evaluation survey” but it focuses on all the requirements for the Program. Evaluation of program delivery therefore also includes other factors identified in Analysis & Design that indicate whether the solution is delivered as planned (for example, whether the program is delivered to the intended target audience at the right time). The A-model suggests that in order to improve Performance, you identify Performance Enablement measures – enablers that are necessary to support the performance, typically learning, a skill, a new attitude, performance support or an incentive. How you measure whether the problem is solved will arise from the analysis and design done originally. A useful mechanism can be an impact survey or follow-up survey, but there should also be concrete business data to provide evidence that the problem has been solved or business performance improved. The key in the A-model is to put it together, as shown in the diagram below. You define the requirements for the Problem, the Performance, Performance Enablement and the Program. Then you assess the outcomes – for the delivery of the program, for the Performance Enablement and the Performance itself and then for the Impact against the business. I hope you enjoyed this whistle-stop tour. For a more thorough explanation of the A-model, read Dr. Bruce C. Aaron’s excellent white paper, available here (free with registration).